BIO-ENERGY – Kohlbrecher Equipment, Inc. 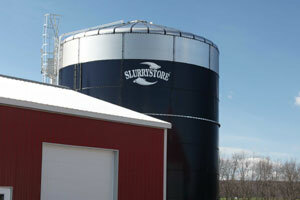 When you need components and options for state of the art BioEnergy Storage Systems, turn to Slurrystore Digester Systems by CST Storage for agricultural biogas and biomass digester tanks and specialty covers. The BioEnergy Storage Solutions product portfolio includes Slurrystore tanks, hardcovers and flexible membranes to reduce overall project costs, save customers time and reduce integration headaches. CST’s digester experience dates back to 1974 and has been long known as a world-class glass-fused-to-steel tank provider with long service life. This relatively impermeable coating of glass frit fused to a high-strength steel plate at 1500 deg F, also has a proven history in aggressive liquid environments like dairy and livestock manure. Other tank options include epoxy coating and stainless steel to satisfy design requirements. Learn more about our BioEnergy Storage Solutions in this brochure.